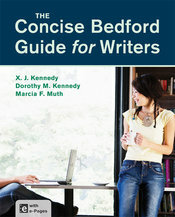 Built on the tradition of the bestselling textbook The Bedford Guide for College Writers, this new brief edition retains the authors’ process-oriented approach to college writing and focus on active learning. The streamlined guide introduces students to the most commonly-assigned writing strategies and situations and to the essentials of college-level research and documentation. The reader, located online, takes advantage of all the Web has to offer, giving students access not only to essays by well-known authors but to innovative, engaging multimodal texts that contribute to the guide’s emphasis on visual literacy. Hands-on "Learning by Doing" activities, available both in print and online, actively engage students in the writing process with the goal of developing skills transferable to higher-level courses and the workplace. "The listing of topics covered is close to perfect. It covers just about everything and does not intimidate."